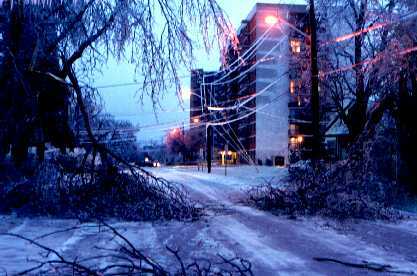 Eastern Canada and Northeastern United States were ravished with freezing rain and heavy snow in the 2nd week of January 1998. 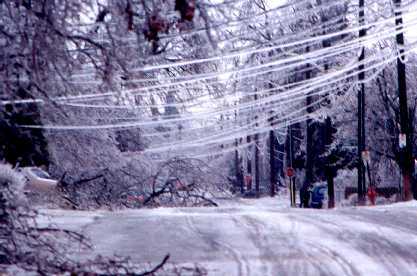 It was a storm which would cause millions to lose electrical power for a number of days. Some lost power for as little as a couple days, others went weeks without regaining electricity. 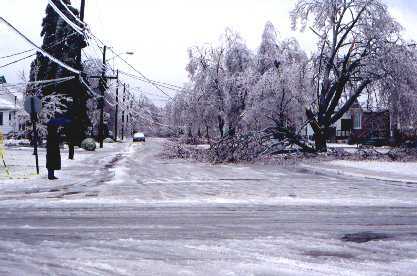 The city of Kingston, like many other centers declared a state of emergency as the pelting rain and snow turned the city streets into skating rinks, and caused the great number of aged trees in our area to become a huge safety hazard. 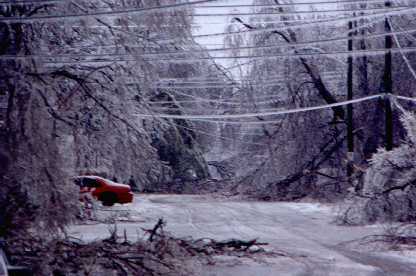 Extensive damage resulted from Ice Storm ’98. The most visible for the majority of citizens was the damage to the trees in the city of Kingston. Kingston is a city which prides itself on its beauty. Very few cities are able to compete with the picturesque atmosphere proved in Kingston. It is a beautiful tourist town, full of history and breathtaking sites. Many of the city streets are lined with aged trees of great stature. A great number of these trees, weighed down by ice and snow lost branches and toppled over. Some citizens found once prized and enjoyed trees to be a life-threatening danger. A few homes had trees fall onto and into them. 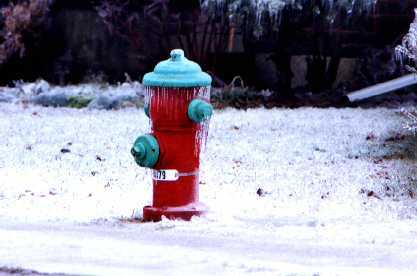 Due to the loss of electricity, most homes in the area began to freeze up. Many residents refused at first to leave their homes to move to places of safety and warmth, especially the elderly. As homes got colder, and as crews and volunteers encouraged more earnestly, people moved to the shelters for warm beds and food. We were without power in our home for 3 days. We stayed in our home (though the only source of heat is an electric furnace). One the 3rd night, we were about to abandon the house to find shelter elsewhere (my brother-in-law’s grandmother, who had been housing some of her immediate family had room for us, as her family’s homes had power restored to them). The temperature inside the house had dropped to 2 C, approximately 36 F by this time (blankets, candles & dogs can only keep you so warm). The forecast for that night was -15 C, approximately 5 F; which would caused the temperature inside the house to drop well below freezing. I dropped my brother-in-law off at his grandmother’s, and returned to my home to pick up my wife and sister. As I pulled into the driveway – the porch light came on! Power had been restored! 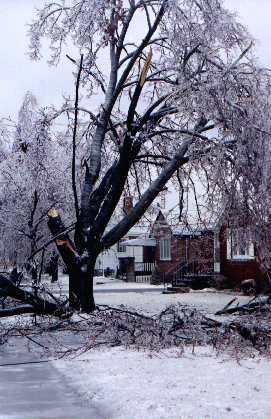 Further devastation from the ice storm was felt by farmers and maple tree operations. Vast reports of maple trees being broken in half and bent beyond repair have arisen, leaving huge financial loss. Due to the loss of power, several farms experienced a great deal of strain and turmoil. Some dairy farmers have sustained enormous losses. Cattle have died from disease, due to the inability to milk them as normal. With the power out, milking machines have been rendered useless, unless a generator can be obtained. 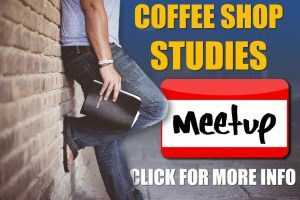 I have heard of cases where 2 farmers shared a generator between their two farms, and worked practically nonstop between the two farms to avoid loss. Speaking of generators, if you were able to get one, you were fortunate. In town, the price of generators escalated to unheard of prices. Shipments of generators could not keep up with demand by consumers. Generators were shipped from all across Ontario. Not only were generators low in supply, but items such as candles were next to impossible to find. Gas stations began to run out of fuel in the first couple of days of the storm (I guess highway conditions prevented deliveries from occurring). 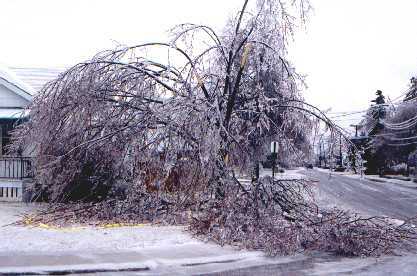 How would I summarize Ice Storm ’98? We were extremely fortunate in this area. There was the potential for great loss and death. To the best of my knowledge, very few lives were taken during the storm. I can recall hearing of an older couple northeast of Kingston who were killed in their home due to fume inhalation (I am unable to remember the exact circumstances, but my heart goes out to the family of these ones). Indeed, God watched over us. We, being an area where natural disaster does not occur, and thus unprepared for the storm, have coped well.